All men over the age of 50 should have regular prostate exams. There are many treatment options available for enlarged prostates and prostate cancer that can help men return to a normal and healthy life. 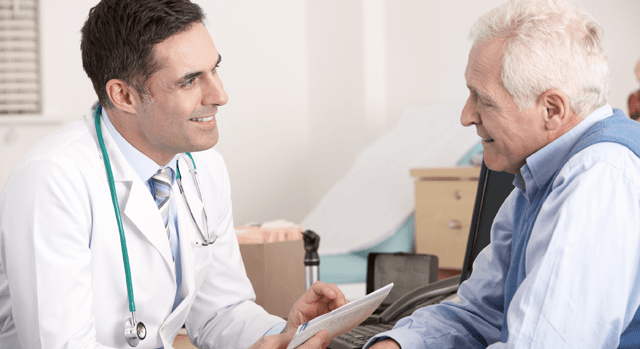 Enlarged prostate or benign prostatic hyperplasia (BPH) is one of the most common medical conditions for men over 55. As the prostate enlarges, it can put pressure on the urethra and cause problems urinating. Men with an enlarged prostate may experience some of these symptoms: frequent urination, weak urinary stream, dribbling of urine, urinary tract infection and trouble starting to urinate. Microwave thermotherapy is available to reduce the prostate without standard anesthesia. Other treatment options to relieve symptoms include medical therapies, minimally invasive therapies and surgical techniques. According to the National Cancer Institute, more than 200,000 cases of prostate cancer are diagnosed in the United States each year. The prostate is a walnut-sized gland in the male reproductive system that produces the seminal fluid that transports sperm. Generally, the cancer grows slowly and men often don’t show symptoms until an advanced stage. Depending on severity, many treatment options are available for patients suffering from prostate cancer. Treatments include surgery, radiation therapy or careful observation. Undesired urinary leakage is a common issue for both men and women. Often, the condition indicates that the urethra cannot close completely. Depending on the severity and underlying cause of incontinence, some of the treatment options offered include varying voiding habits, biofeedback, medical therapy, minimally invasive procedures such as the injection of collagen and other surgical approaches for correction. One of the most common disorders of the urinary tract, kidney stones are sharp growths that can develop for a variety of reasons. Lack of fluids in the body is the main cause of kidney stones while others include diet choices and certain medical conditions and medications. Kidney stones can often times pass through the body unnoticed but can cause severe pain if they grow large enough. Several treatment options are available if a stone does not pass naturally, including shock wave lithotripsy, which is non-invasive. The rate of testicular cancer in the United States has increased over the last several decades, according to the American Cancer Society. Fortunately, testicular cancer is often treatable and curable with early detection and treatment. Many treatment options are available including surgery, radiation therapy and chemotherapy. If surgery is needed, advancements in the procedure can help eliminate the cancer while maintaining the function of the male reproductive organs. The National Cancer Institute estimates men are diagnosed with bladder cancer two to three times more often than women. Smoking cigarettes is a major risk factor for developing bladder cancer. Other risks include increasing age, exposure to certain chemicals and a family history of bladder cancer. People with bladder cancer may notice blood in their urine or experience frequent or painful urination. Surgery is the most common treatment for bladder cancer while others include immunotherapy, radiation therapy and chemotherapy. While anyone can develop kidney cancer, it is more common in people over the age of 50. Risk factors include genetic conditions, obesity and smoking. Many kidney tumors do not produce symptoms but some people with kidney cancer may experience blood in their urine, a lump in the abdomen, weight loss, pain in the side or lower back and loss of appetite. Surgery is the most common treatment for kidney cancer. If necessary, the affected kidney may be removed.